Construction has started on 25 King Street in Brisbane, the project that is set to become the tallest engineered timber office building in the world. Designed by architect Bates Smart as part the $2.9-billion Brisbane Showgrounds redevelopment, the tower will reach nearly 45 metres (or nine storeys) in height. The design includes three bespoke ground-level retail tenancies built using cross-laminated timber (CLT) and glulam (glue-laminated timber) which has a structural strength akin to traditional concrete and steel. 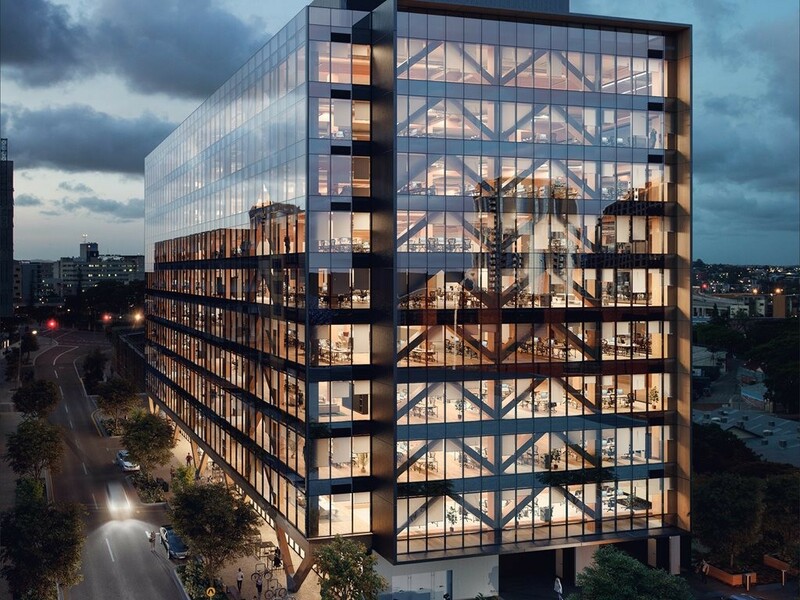 “25 King is set to become the tallest and largest engineered timber office building in the world, which is a wonderful achievement for the Brisbane Showgrounds precinct,” said Mark Menhinnitt, Lendlease’s managing director of urban regeneration. Queensland acting premier and minister for infrastructure and planning Jackie Trad said 25 King was breaking new ground in its use of structural timber in a building of its type and size. “This is a great example of the type of development we’ll be seeing more of in the future, and it puts Queensland at forefront of cutting edge sustainable construction practices,” Trad said. Constructed with wood, CLT has a far lower carbon footprint than other building materials, the production process produces zero waste, and timbers are sourced from certified sustainably managed forests. In terms of other sustainable features, 25 King will feature controlled lighting, heating and cooling from a single interface, and large glass areas will maximise natural daylight, while sunshades on the western and eastern facades will reduce energy consumption; further reducing the buildings carbon footprint. According to the developers, the tower comes with a 6 Star Green Star Design and As Built v1.1 and a NABERS Energy 5 Star rating. This development is Lendlease’s fifth engineered timber building in Australia and is due for completion in 2018.